Mumsnet is known for answering hot off the press issues and providing us with some saucy, scandalous and downright bizarre entertainment, there's never a dull moment. But this concerned user's call for help has really left the internet dumb-founded. 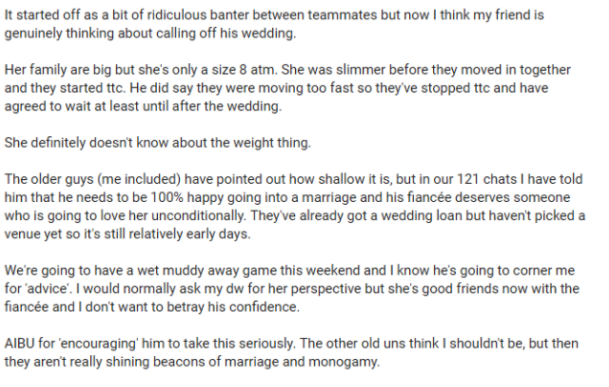 The user is literally asking for advice about a friend that's considering calling off his wedding because his size 8 fiancée has a fat family. Despite 'ttc' (trying to conceive), this piece of trash man just can't make up his mind if the weight of this SIZE 8 woman's family is too big of a problem to overcome. The user mentions that he's tried to tell this guy that he's being shallow, and that not only should he love her unconditionally, but that something so small as the weight of her family has no bearing on his marriage to her. The user finishes the post with 'AIBU', 'am I being unreasonable' for 'encouraging him to take this seriously?' No OP, if anything you're being unreasonable by not telling his fiancée to dump this worthless imbecile. A colossal wanker indeed. Dump him, sweetie. You and your wonderful family can do so, SO much better.